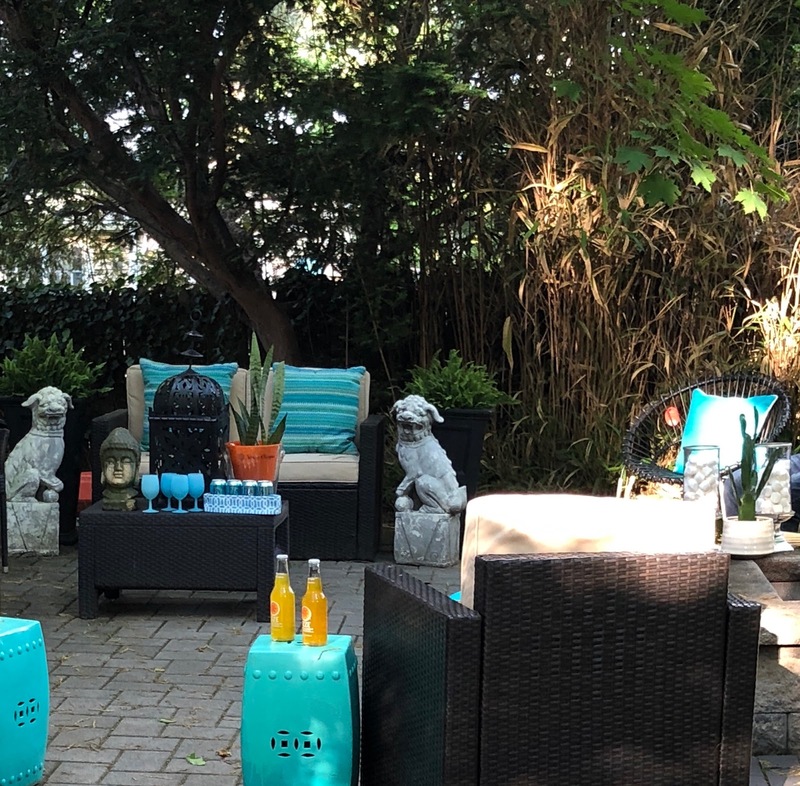 For the past couple of weeks, I have been working with Patdo Light Studio and designer Debra Konner on a patio redesign. After visiting the Patdo showroom, recently, and seeing all they have to offer, and knowing that I had this project on the books, I decided to bring Mari Lou of Patdo on board. She works with Debbie, a local interior designer, whose projects include impressive properties all along the east and west coast, AND VOILA, our dream team was born. I love the color turquoise and knew I wanted to use it as one of the focal points for the decor. I really enjoyed working with Mari Lou and Debbie. Their expertise really transformed and pulled the space together. Here are the end results. I will try to source as many of the pieces below. On a separate note, I really have to thank the incredible Debbie for all of the vignettes below. Her vision is fabulous. 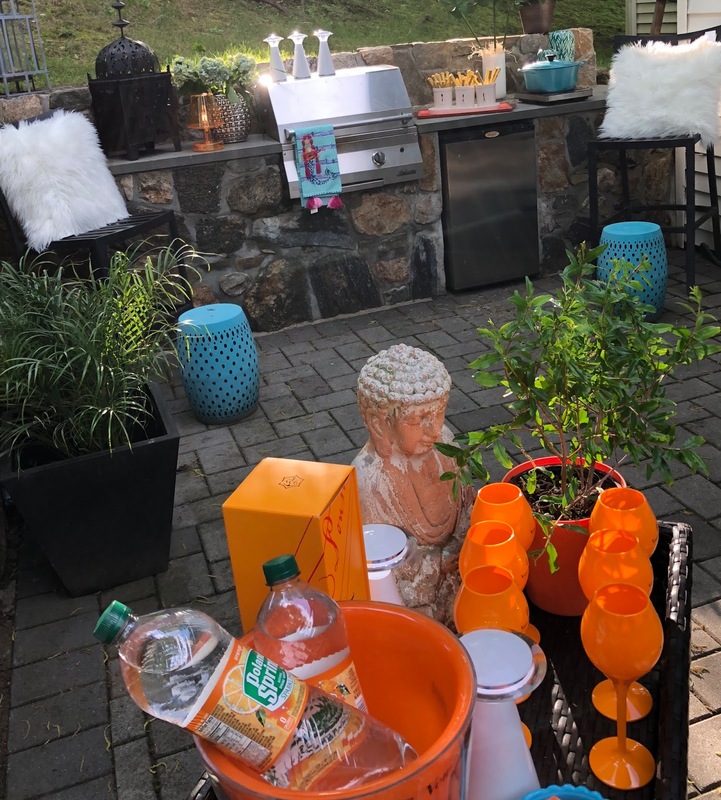 She was able to take so many of the things I already own and incorporate a few things she bought and the finished product was simply breathtaking. I cannot tell you how happy I am that I met Debbie. We are working on my dining room next...OMG!!! Stay tuned. If you are thinking of starting any home decor products, I would consider, EMAILING Debbie right away!!!!!!! The black iron lanterns were from HB Home a few years ago. The Foo Dogs and Buddha are Vintage. The oval chairs were a great find!!!!!!!! The turquoise pillows are from Home Goods. I bought the garden stools last year but HERE are a similar style. The soda can holder came from Roberta Roller Rabbit. I am running there tomrorow to get another!!! This adorable conversation table and chair set are available here!!!! The glasses are vintage. I made the straw CC bag. The adorable sun hat is from Whole Foods!! The best bug repellent is from Nantucket Spider!!!! And, who can not live without all the latest fashion magazines????!?!?!?!?!? The metal garden stools are from Joss and Main. 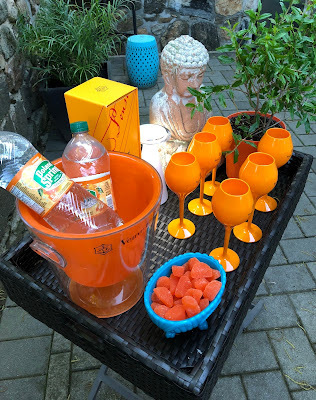 The Veuve Cliquot glasses and ice bucket are from ebay and are channeling Aspen's Cloud Nine Alpine Bistro!!! The Mongolian Fur pillows were from Dovecote in Westport and I use my Le Creuset, on my outdoor burner to cook corn and other sides along my grill. Oh..the pomegranate tree is from Whole Foods!!! And the turquoise milk glass candy dish is vintage. The Foo Dogs are from Dovecote in Westport. My friend Alicia used her lined revere bowls at our book club lunch and she inspired me. I ordered THESE from Amazon and put clementines in one for the centerpiece. Here are the dinnerware and bowls. The turquoise silverware, glasses and all placemats are from Homegoods. The incredible LED table lights are from Patdo. I am in LOVE and all the info is in the next few photos!!!!!! This orange LED battery operated lamp is adorable. I love this one next to the grill and I also got a pink one for my daughter's nightstand. It makes a great reading lamp and perfect for a dorm room too. These lamps come in a bunch of colors....EMAIL Mari Lou for more information and special pricing for NS Lifestyles Readers!!! Here are my favorite items on the entire Patio. Everyone needs these cordless battery operated LED lights. They come in white and stainless. They are so affordable and are perfect by your grill, on your outdoor dining table, steps, front walk, boat, anywhere where you need a little chic lighting!!!! EMAIL Mari Lou for more information and your special pricing. I use 4 on my dining table, 3 here on my grill and a few more scattered throughout my seating area. They are that FABULOUS!!!!! I am in LOVE with this European dome light..it is the chicest thing ever!!!!! I like to move it around my patio all night long because it looks incredible EVERYWHERE!!! Mari Lou can also help with this special item. Here is another favorite, these LED cordless pendants that I have hung in my trees. I am so in love that 2 is def not enough. I have a few more on my wish list. They come on a long rubber loop that you can just loop around so many places and they stay perfectly in place all day and night long. Mari Lou just got another shipment of these but HURRY they go fast!!! Here is a better view of the lights at night!!! How amazing do the table lights look..I told you they were a must!!!! Sorry...I love them all so much I had to show you again!!! Now time to roast the marshmallows and enjoy with my talented ladies!!!! One last thing, the outdoor poufs are available HERE.